Olives alone have only four to five calories each. 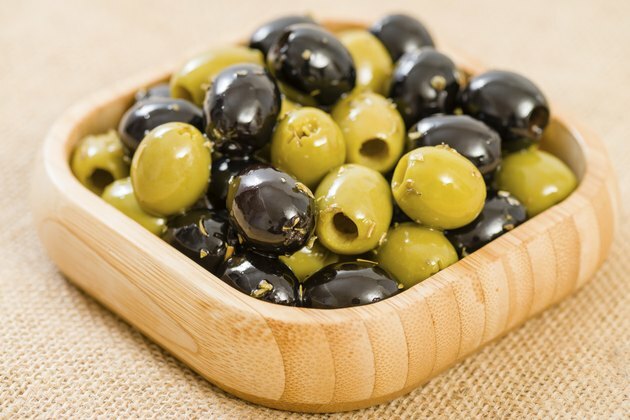 "Low-calorie" foods contain 40 calories or less per serving, according to U.S. Food and Drug Administration labeling guidelines, and a serving of 10 green or black olives has only 40 calories. Removing the pits and stuffing them with other types of foods, such as garlic, peppers, or cheese can significantly increase the calorie content. Also, adding oil to olives as a dressing will increase the number of calories. Stuffing olives with cheese significantly increases the fat content of the olives, which adds calories. One gram of fat provides your body with about 9 calories. Adding blue cheese, cream cheese or goat cheese adds 8 to 9 grams of fat per ounce of cheese. Stuffing olives with peppers or garlic does not significantly increase the calorie content of the olives, but just a teaspoon of olive oil inserts 4.5 grams of dietary fat. Does Eating Onions Cause Body Odor?